Melisa Russell is the wife of Chicago Cubs shortstop, Addison Russell. The two met through a mutual friend in Pensacola, Florida, where Addison grew up. 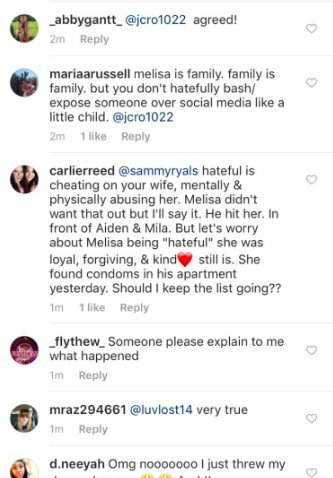 The couple appears to be having some marital issues, uncovered after Melisa posted about “new beginnings” on Instagram. Hours after this news hit the internet, Addison Russell released the following statement. “Being free to be able to make your own choices for your own happiness beats being cheated on, lied to, & disrespected any day. #herestonewbeginnings #onlygetsbetterfromhere,” Melisa wrote. The comments section on the post ended up making things even more complicated. According to the report, a “friend” of Melisa’s decided to further the discussion and made bold claims that Addison had hit Melisa in front of the couple’s two children. “Hateful is cheating on your wife, mentally and physically abusing her. Melisa didn’t want that out, but I’ll say it. He hit her. In front of Aiden and Mila. But let’s worry about Melisa being “hateful.” She was loyal, forgiving, and kind. Still is. She found condoms in his apartment yesterday. Should I keep this list going?” the comment read. The Instagram account used to post this comment has been deleted. A short while later, Melisa took to Twitter to explain her post. “My post is meant to be empowering, not degrading. At all. I hope it empowers women and inspires other women to ‘not take s–t’ from anyone, regardless of who they are. Hoping to empower other women to stand up for themselves is not a crime AND … i think it’s brave and REAL to show that life’s not perfect, and it’s ok. Sorry not sorry,” she wrote. This post has also been deleted. According to the Chicago Sun Times, MLB is investigating the claims. “MLB is investigating based on the posts and is expected to try to interview both the wife and the friend under its 2-year-old domestic violence policy,” the site reports. Thank you @julsscint for my dream brows, seriously so talented! Microblading is the best ever, especially when you have the right person to do them! This is after my second touch up, & healing process. They're perfect & most importantly looks so natural! #microblading #browsonfleek #alldayeveryday message my girl @julsscint if your interested! The last photo that Melisa posted with her husband was back in January. While it’s unclear exactly how many pictures of her husband Melisa may have had on Instagram, she does not have many up now. Her last post is a selfie from one week ago. The comments on that photo have been shut off. However, fans and other social media users have been blowing up Melisa’s Instagram, using the comments section on her post from May 30. Addison and Melisa married last year. Their exact wedding date is unclear; While some reports claim that the two wed in June, the photo above was posted by Melisa in January. The couple welcomed their son, Aiden Kai Margallo Russell on August 25, 2015, four months after Addison made his MLB debut with the Cubs. Addison also has a daughter named Mila, with ex Mallory Engstrom. In an interview with MLB.com last year, Addison spoke very highly of his wife, giving her credit for becoming a mom at such a young age (she was 21) and handling being the wife of a professional baseball player. “She had a lot of things to overcome herself — being brought into this lifestyle and being a mother and in this lifestyle are two different things. It’s hard to get used to at first. She’s here, we’re married and we’re going to have each other’s back,” Addison told the site. Melisa and Aiden were on hand to support Addison in the 2016 World Series. The mother and son attended a few games and were right by Addison’s side as his team beat the Cleveland Indians in Game 7 of the championship. Melisa, Aiden, and Addison’s daughter, Mila, all participated in the Cubs parade, celebrating the team’s first World Series win since 1908. “Happy Birthday Melisa @russellmelisa #23 is a dope age! You deserve to have the best birthday in the history of birthdays because, Mama you are 20 Times more beautiful on the inside than your outward appearance. Your outer beauty is something outta this park, world universe, sheee’ss gone!! Grand slam Homerun! walk it off. I miss everything about you. And that’s because I want you to have the best #23Birthday i love you baby,” Addison wrote on Instagram. You can see more photos of Addison and Melisa in the video below. Melisa Russell is the wife of Chicago Cubs shortstop Addison Russell. The two appear to be having relationship issues.